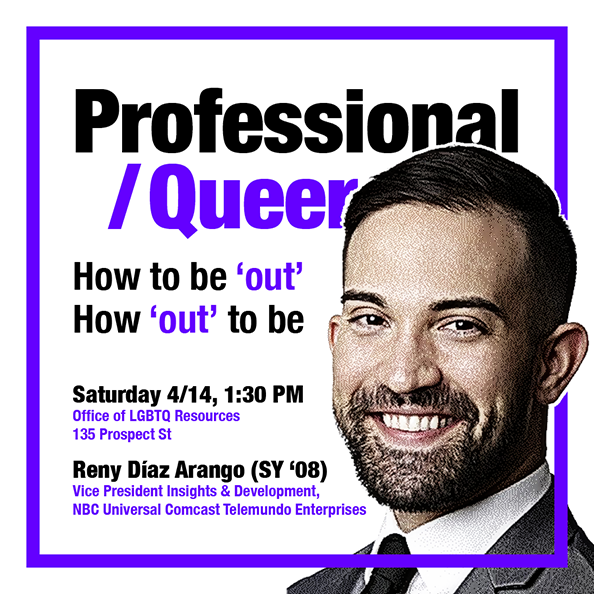 Reny Díaz Arango (SY ‘08) discusses the ins-and-outs of being professional and queer, how to be ‘out’, and how ‘out’ to be in the workplace. Reny Díaz is Vice President of Strategic Insights & Consumer Development at NBCUniversal Telemundo Enterprises. Appointed in March 2015, he currently oversees developmental consumer research for Telemundo Enterprises and works across the NBCU portfolio in the planning, creation and communication of research-based multicultural strategies and innovations. Reny serves as a member of the Telemundo Enterprises leadership team responsible for growing audiences and revenue to NBCU across platforms. Prior to this role, Díaz served as Head of Research for Fusion, ABC News & Univision’s English-language joint venture. He began his career at Nielsen, supporting Univision Communications and the advancement of Nielsen’s Latinx thought leadership. Reny is passionate about education for all, particularly in the Global South. He serves on the board of Anseye Pou Ayiti, an organization of Haitian educators recruited and equipped to unleash transformative outcomes for Haiti’s youth. Reny is a proud Miami native and holds an undergraduate Sociology and History degree from Yale College. He is also an alum of NBCUniversal’s Pivot Leadership Program and Nielsen’s Emerging Leaders Program.